Some good poems, I guess. I cannot hit any phrase at all. 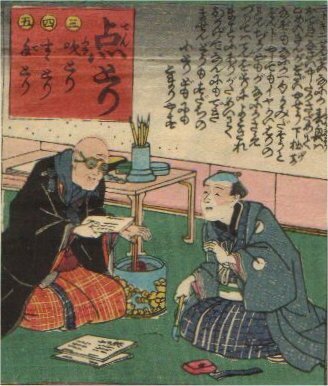 Haikai, Senryu and Kyouka were the indispensable ground for intellectuals in Edo. Although Haikai has lost its popularity once after the death of Bashou, Sumi Taigi and Yosa Buson claimed the returns to Bashou in Tempou period again and Kobayashi Issa was so active in Bunka-bunsei period. Senryu was born from adding-on of leading phrase and created word playing culture of common people around the activities of an editor Karai Senryu. Kyouka was derived from Waka, Oota Shokusanjin and Yadoya Meshimori had competed their wit in word play. All of them represent pliant playing minds in Edo.